Restaurant and bar | Hotel "Aurora"
The Avrora hotel features the very best selections of European cuisine. Allow us to invite you to a splendid gastronomic journey. With pleasure. At your service. The Avrora’s Nevsky restaurant opens its doors for our guests to savor gourmet meals and fine beverages served in a dashing atmosphere exuding contemporary luxury. Running special events calls for unique and exclusive settings. 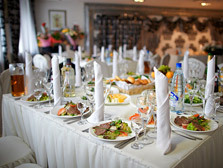 From private to gala dinners, all become an unforgettable experience at our small banquet hall. The Avrora bar features a varied menu of European dishes and an ample selection of elegant and exclusive drinks. During the warm season of the year, the pleasant and inviting summer atmosphere pervades our terrace, where having lunch or dining al fresco is a real delight.